It never fails. Everything will be quite and peaceful at my home while I am watching a movie or TV show. That is, until a really important part of the show. Then my wife will come in to talk to me about something important or the kids will have some emergency. That's why I love the pause feature on my DVR. I can pause my show and tend to what is more important. Then when the crisis is over, I can return to my show in peace. I wish life had a pause feature. So you could pause one situation to give you enough time to deal with another important situation over there, or at least long enough for you to catch your breath. Since you can’t pause life, sometimes you just have to take a moment to pause yourself. You have to make a conscious decision to turn away from one thing and focus on something more important--even if it’s just for a few moments. Maybe it means turining off the TV, your cell phone (which I plan to do more this week), and taking a Sabbath to pause and admire something more important. At that time the Roman emperor, Augustus, decreed that a census should be taken throughout the Roman Empire. 2 (This was the first census taken when Quirinius was governor of Syria.) 3 All returned to their own ancestral towns to register for this census. 4 And because Joseph was a descendant of King David, he had to go to Bethlehem in Judea, David’s ancient home. He traveled there from the village of Nazareth in Galilee. 5 He took with him Mary, to whom he was engaged, who was now expecting a child. 6 And while they were there, the time came for her baby to be born.7 She gave birth to her firstborn son. She wrapped him snugly in strips of cloth and laid him in a manger, because there was no lodging available for them. Jesus was born into a busy world. It was a world of government and politics. There was an inconvenient census that disrupted life, there were taxes being collected, people traveling all over the Mediterranean world (the innkeeper's business in Bethlehem was booming! ), and even working class shepherd watching sheep. But a baby doesn’t wait for a busy world. When it’s time, it’s time. 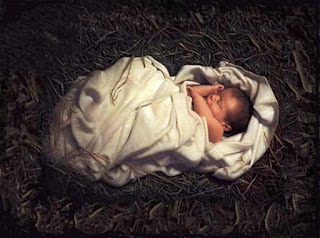 And so Jesus was born at just the right time--God’s time--whether we were ready or not. Mary and Joseph experienced God’s irrepressible timing more than anyone else. The birth pangs began. The contraction ensued--washing over Mary in painful waves as Joseph hastened to find shelter. They clambered into a stable in a hollowed out cave. The baby came. Mary and Joseph were the first to pause for God’s baby. The shepherds were next. God sent a big sign to get their attention--an army of angels heralding the news of the baby's birth. The shepherds paused to go admire the baby Jesus. They found him lying in a manger in Bethlehem just as the angels said. Who or what has been an angel to you, saying something big to get your attention and beckon you to pause and pay attention to something more important? The Wisemen also paused. God gave them a more subtle sign--a star in the east. I wonder how many people noticed that star? How many who noticed took the time to find out its meaning? How many who knew what it meant made the effort to go find the baby Jesus? Only the Wisemen. For it is truly a wise man who--when he sees God’s sign--obeys, even if it means taking a long and difficult journey to a far away land. How far are you willing to go to pause and admire Jesus? What’s the most important thing in the story of Christ’s birth? It’s not the census or inn. It’s not the shepherds or the Wisemen. It’s not even the angels or the star in the eastern sky. Even a child knows the most important part of the Christmas story is baby Jesus. Our world is no less busy than that of Mary and Joseph. But what’s really important in our busy story? It’s not all the things we have to get done before the weekend. It’s not all the crazy characters we meet along the way. It’s not even the miraculous signs we might see as we go through this life. The most important thing in our story is Jesus. Will you pause--just for a moment--to admire this precious little Baby?